In Kerala or elsewhere, most of us don't remember the last time we watched a movie in a theater. 24 hour channels and almost simultaneous DVD releases of movies have made it more comfortable for us to watch our favorite movies at home instead of having to queue up at a theater. Work pressure and other time constraints contribute to the decision of staying at home to watch a movie. This is why many modern home builders in Kerala opt for a theater experience at home- the Home Theater! Home theater is difficult to define because in actuality it's really just a vague term for how you approach home entertainment. Generally speaking, a home theater system is a combination of electronic components designed to recreate the experience of watching a movie in a theater. The image and the sound, together with the right equipment, can create the ultimate home theater experience. If you're looking to design a home theater system, you have a lot of decisions to make. First youʼll need to decide what room you want to install your home theater and how far you want to go. Turning a family room or flexible space into a media/TV room is a lot different than creating a fully functional home theater. Once youʼve decided the level of home entertainment you want from your new home, then you can begin to select the necessary components to create your own personal home theater. 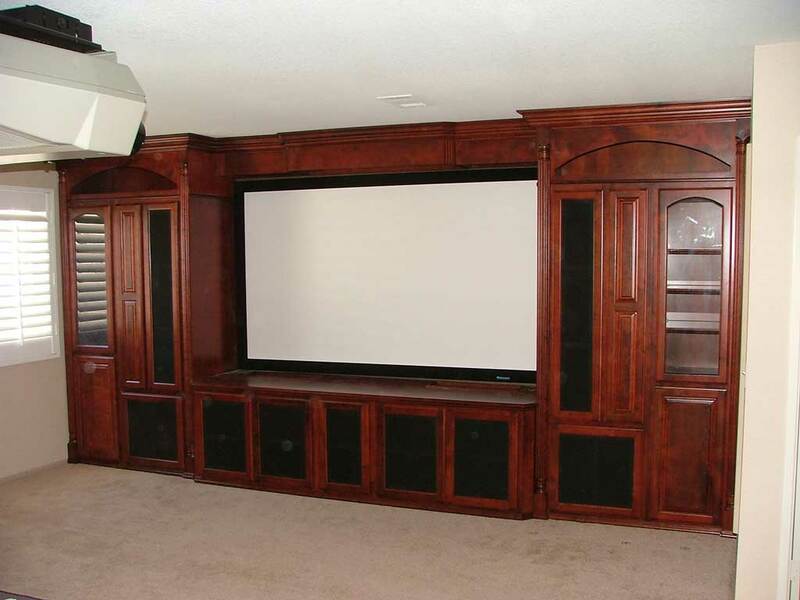 What you choose for your home theater system will depend on how much money you are willing to allot to this space and how important certain areas of performance are to you. So whether you are planning on spending Rs.25000 or Rs.25,00,000 you should spend time understanding what each component does, so you can choose the right equipment to satisfy your audio and visual needs. The basic necessities to create your home theater are a 27-inch or larger television, movie playing device (DVD is recommended), speakers, a surround sound capable stereo receiver, all the cables and connectors and a high-quality surge protector. 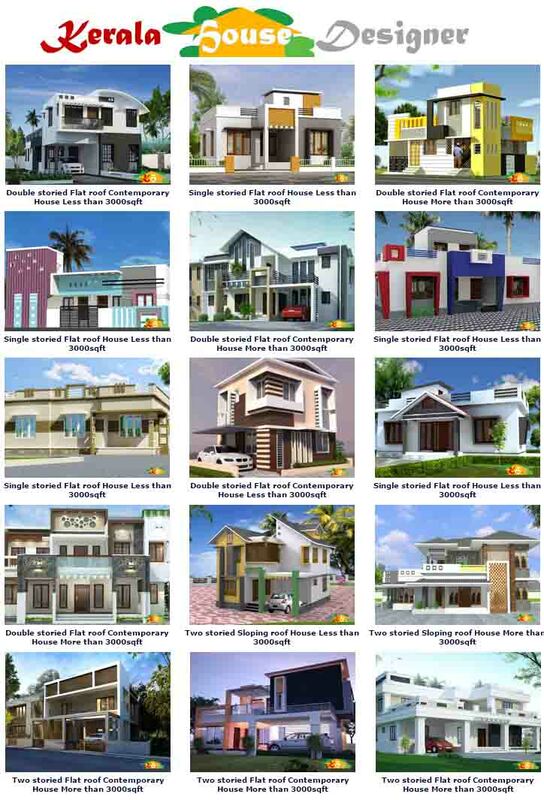 If you are building anew home, it is a good idea to spend a little extra money for better quality equipment. Remember, you get what you pay for. Think of your home theater system as if it is a jigsaw puzzle. Many pieces fit together to complete the presentation. The pieces must be in the right places. 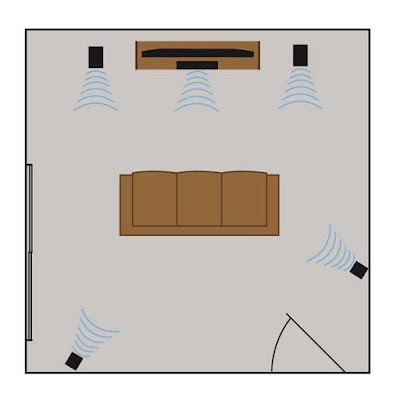 With a home theater system, the pieces can be placed in many different positions to work together producing theater-like picture and realistic sound. If you know a little about each of the components, you will have an easier time deciding what you want. With the television, the first thing that you are going to choose is the size and shape. For all the new movies in wide screen format, you will need a rectangular TV with a 16:9 ratio to view them in the original format. A traditional TV is square with a 4:3 ratio and will show the wide screen smaller with black screen above and below the movie. The best advice on the size you choose is the largest you can afford. 27 inches is probably the smallest you should accept. The distance between the screen and where you sit to view it should be equal to about three times the screen size for optimal viewing. So for instance, you have a 40-inch TV, it should be ten feet (120 inches) from you for best viewing. With this in mind, it may be to your advantage to layout your floor plan in the room with the TV ahead of time. Decide where the TV will be and where people will be sitting. Measure the distance and choose a TV size accordingly. Projection TVs work differently than conventional TVs. They form a small image on a device inside the projector, either a CRT or LCD, and then shine that image onto a large screen located elsewhere. There are two types of projecting TVs - rear or reflective projection and front or transmissive projection. With a rear projection, the screen is located within the TV box itself. Light reflects off the projection display panel and is then projected onto the screen. On a front projection TV there is a separate screen which, allows for greater size that sends the picture across the room to a screen, much like a traditional movie projector. Both systems have four basic parts -a projector, screen (separate or built-in), control panel (separate or built-in) and a sound system (separate or built-in). Most rear projection TVs for home theater systems tend to look like very large- screen (up to 80-inches) conventional televisions. Each one is basically a large box that contains all of the above parts, while front projection TVs are spread out across your room in four components. Cost for either system starts around Rs.75,000 and escalate to well over Rs.25,00,000 (for a front projection TV). Plasma and LCD TVs are the newest television technologies. They have excellent picture quality. Plasma TVs have larger screens, better viewing angles, superior image refresh rates, and lower costs. They are a perfect choice for home theaters. LCD TVs are rapidly improving, but still have problems such as ghosting trails on fast moving images, small screens, and higher costs. However, they do have longer life spans, lower weight, lower power consumption, and no burn-in risk. High-definition televisions carry a more detailed image with a digital signal, which is encoded with surround sound information. All of the televisions mentioned before are available in HDTV. Some of them might require a separate HDTV decoding tuner though. These televisions can be viewed much closer than ones that do not have high definition because they have such a high resolution. These TVs will become necessary in the future because the FCC now requires television programming to be broadcast in digital format. The screen is what you are actually viewing your home theater on. There are different materials used to make these screens by the manufacturers. Most are matte-finished screens or acetate sheets with complex technologies to improve brightness and clarity. Knowing which type of screen you want will clear up a lot of issues before you make the purchase and bring it home. The receiver is basically the brain in most home theater systems. All of the audio comes together here. The receiver decodes signals from the inputs (DVD player, satellite dish, cable television) and routes them to the proper outputs (television and speakers). A good receiver has inputs and outputs, a built-in timer, surround sound capabilities, built-in amplifiers and equalizers. Prices range from Rs.50,000 to Rs.2,50,000. Be sure that the receiver you choose has at least 100 continuous watts per channel and enough outputs for all of your speakers. Pre-amp and power amps can be bought separately, but most receivers come with them. The pre-amp equalizes the audio signal while the power amp boosts it. Purchasing them separately allows you the ability to fine-tune and upgrade individual speakers. You are more able to get superior sound at high volumes this way, but the extra cost can range Rs.50,000 to Rs.5,00,000 per unit. A controller replaces the receiver in a state-of-the-art home theater. What the controller will do that a receiver will not is control both the audio and the video. You will need a separate tuner for radio stations if you use a controller. To listen to your favorite music, you will need a good quality CD player. They can be purchased in a one player or a two-piece players, where the unit that houses and spins the discs is separate from the DAP (Digital Audio Processor) where the disc information is processed. Since the DAP can be used with other components, you will get more usage if you use separate components. The DAP has several input and output jacks. One of the most popular parts of the home theater system is the DVD Player. DVD's (Digital Versatile Discs) are a versatile multimedia platform for music, movies, and computers. They have better picture quality and most have Dolby Digital or DTS sound that you like at the theater. Most DVD movies have an on-screen menu to watch certain parts, learn about the movie, and more very quickly. High-end players are usually compatible with audio CDs and equipped with viewing options in letterbox for wide screen TVs and standard. VCRs still remain very popular because of the ability to record. They do not have the wide screen or surround sound capabilities though. The tapes will also eventually wear out. The DSS (Digital Satellite System) is not like the satellite dish of yesterday. It is much smaller and more technically advanced. The signals they receive are much better giving superior imaging like laser disc players with CD quality sound. It is easy to set them up and tune them in. They can handle six-channel surround sound and high definition television. The monthly cost is about the same as cable. Sound is half of the experience of the home theater system. You should try to get the best speakers possible. They should be capable of reproducing a wide range of frequencies without distortion. Listen to the speakers before you purchase them. Follow the rule that no two speakers sound alike, so choose by personal preference. Your home theater should have six speakers or more to create the best sound. These should include left, right, and center speakers across the front. There should be a couple of surrounds and a subwoofer or bass for the low, loud vibration feel. As unimportant as it may seem, cables and interconnects can be the difference between a good and a great system. This is true no matter what type of system you choose. Unrestricted flow of the output through the cables is important. If the cables are not the right quality or type, they will not allow this. Select heavy gauge cables and gold plated connectors. If you are concerned about the appearance of these cables, go with a flat speaker wire. They are as thin as a credit card yet flexible enough to make corners. They can be mounted on walls or ceilings. You can wallpaper or paint right over them. Try to buy a universal remote control to avoid clutter and confusion. Pretty much every piece of electronic equipment comes with a remote now, and after a while there are so many you can't keep track. Universal remotes are pre-programmed to control many devices by many different manufacturers. They come with easy to follow instructions so setup is quick and easy. A remote with an illuminated keypad or backlight is the best option. If you have equipment that is in a closed cabinet, choose a remote that is radio frequency-capable. The important thing to remember when you start with your home theater is that you want it to feel as close to a real movie cinema experience as possible. Put the system front and center at eye level, rather than off to the side. Sound travels better from the speakers if they are mounted on a wall or set on stands, not on top of bookshelves or cabinets. The three front speakers should be aligned with the television screen and the two in the rear should be one on each side of the listener just a little above ear level. If you must stack the equipment, leave a minimum of 8 inches between them and the wall to allow for ventilation and easy installation. The receivers will create the most heat so put them on top of the stack or better yet, on their own shelf. Power cords can cause interference and decreased signal quality for cables and wires. Don't bundle your wires and cables or place them close to the power cords. A notable tip, test your speakers before you trim the speaker wire to avoid cutting them to short and finding that you don't like the sound and have to move them. Hiding speakers in the ceiling and walls is a great idea in most rooms, but in a home theater, you may want to keep the speakers away from those surfaces. 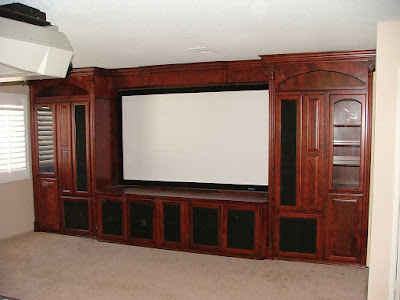 In a home theater freestanding speakers that stand on the floor and are housed in their own cabinets or box enclosures are the best option, because this type of speaker is specifically tuned to its enclosure and produces a better sound quality than other types of speakers. The only drawback to freestanding speakers is that they take up additional space. In new construction, you can have your contractor/designer build the speakers into the design of the room. For example, they can be contained inside architectural details such as columns and prosceniums, or they can be placed behind walls that have been covered with acoustical fabric. 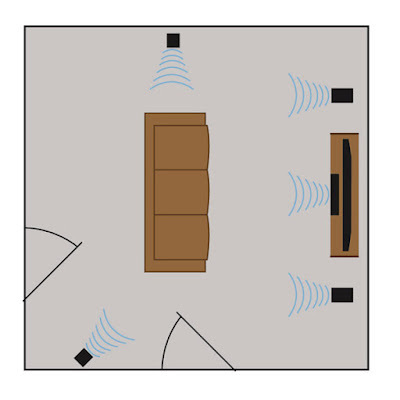 Since not everyone's entertainment room has the ideal layout for a home theater system, we've come up with a few tips to help you deal with odd-shaped rooms. 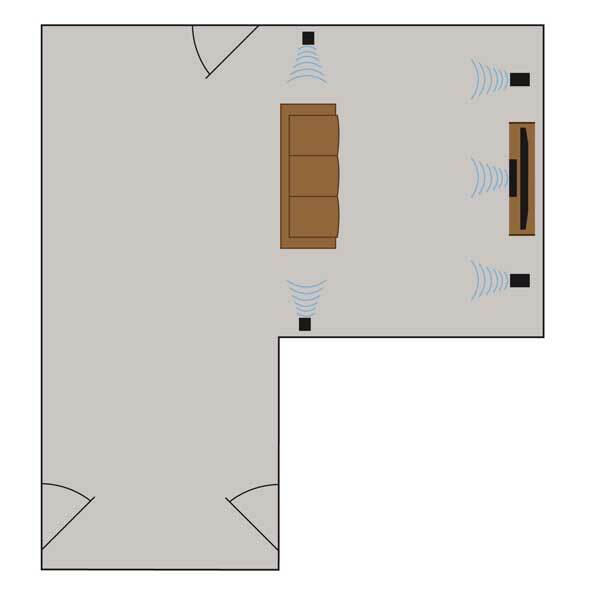 If your room accommodates it, try to make sure your listening position is somewhere in the middle of the room (i.e. away from the back wall) to improve the front soundstage and help the surround speakers work better. 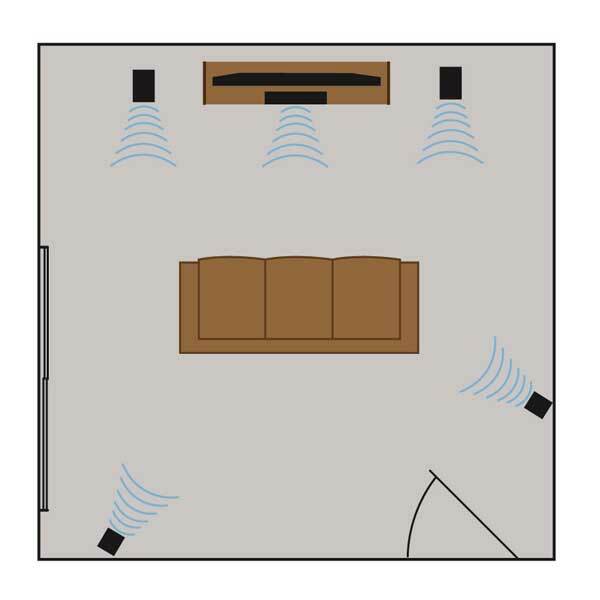 Position the main speakers so that they fire into the length of the room, rather than the width. 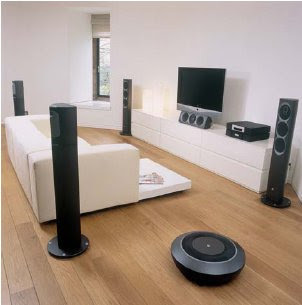 If you want the best surround effects, place the surround speakers on floor-stands. You'll want them to be at roughly equal distances from your listening position. If stands aren't an option, you can also wall-mount your surround speakers. You can even mount them to a joist in the ceiling, if you've got a ceiling-mount bracket, though your speakers might not sound their best when placed that high. Again, you'll want your surrounds to be roughly equal distances from your listening position. For a really clean look, try in-wall or in-ceiling surrounds. Check out our placement guidelines for these types of speakers, or watch our short in-wall speaker installation video to get an idea of what's involved. If you have to place the rear speakers at different distances from your listening position, then you can use the speaker levels in your receiver to help compensate for that difference, or rely on your receiver's auto-calibration to handle that for you. It'll work best if the difference in distance is 5 feet or less. You can also adjust speaker levels to compensate for differences in distance between your front left and right speakers. However, we recommend you try and place them equidistant from your listening position, or within a few inches of that, whenever possible. You'll notice more subtle differences in volume and timing in the front soundstage than you will in the back. Below we've come up with a few simple diagrams so that you can see our tips in action. Here we moved the speaker to the back to avoid a window. You'd probably need to increase the left surround speaker's levels on your receiver to compensate. Alternatively, you could mount the speaker higher up, above the window. Here we moved the speaker to the back to avoid a door. Again, you'd probably need to increase the right surround speaker's levels on your receiver to compensate. 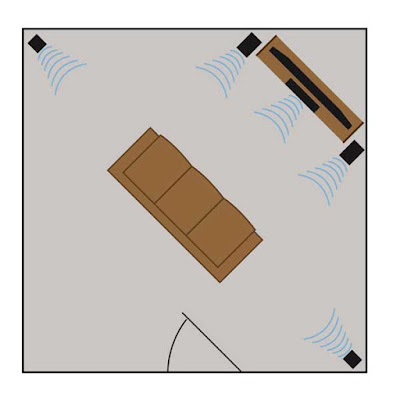 You could also mount the left speaker further back, so that the two speakers are equal distances from your listening position. Here we placed the listening position in the middle of the room, so the front speakers fire lengthwise into the room. We also mounted the surround speakers in the corners of the room, at equal distances from the listening area. 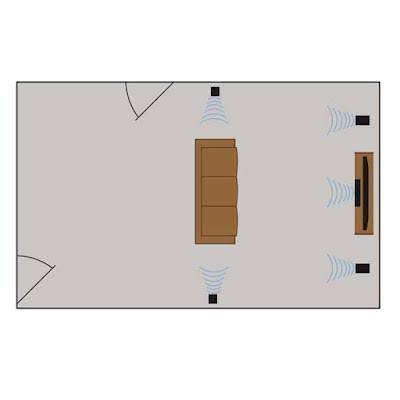 Again, we placed the listening position in the middle of the room with the front speakers firing lengthwise into the room, and the surround speakers mounted on the side walls at equal distances from the listening area. In this L-shaped plan, we chose a space clear of doors and windows, and placed the listening position in the middle. The front speakers are firing lengthwise into the space, with the surround speakers mounted on the side walls at equal distance from the listening area. When shopping for home theater seating there are lots of things to consider like comfort level, features, colors and material. There are plenty of online shopping centers to buy it. The evolution of Home Theater Seating has made lots of home owners have a perfect cinema place at their home.